On Monday evening Maccabi Haifa clashed with Bnei Sakhnin to open the Sammy Ofer Stadium. 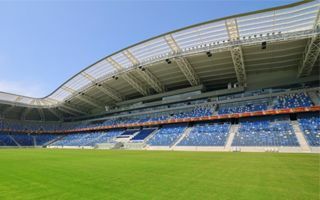 The largest sports ground and one of the largest across the country was nearly full, which at least partly answered one question: will Maccabi and Hapoel be able to make good use of their new home or will it prove too overwhelming. For Hapoel this wasn’t the case when the club first took up playing at Sammy Ofer in late August, but with not all stands open and complicated safety situation in Israel, this is yet to be verified during the league season. Maccabi enjoyed a very good transition from the old Kiryat Eliezer Stadium, having sold 15,000 season tickets. That’s twice the old number and a result unmatched in Israel. No wonder the opening drew a capacity crowd of 27,200 people, leaving almost no empty seat (or staircase, in some sections!) and providing a truly impressive support. In football terms it also seems to have been a very good game. Though Maccabi struggled to score until the 3rd minute of first half stoppage time, the second half brought five more goals and left the game with 4:2 in full time. The Monday opening ends a decade-long saga of this stadium. Along initial plans the ground was to be built nearly 10 years ago, but ended up with groundbreaking in July 2010. Then it took almost 4 long years to deliver it, making especially the last year a really frustrating one for fans. The stadium was nearly ready in mid-2013, but furnishings and trouble with field’s turf quality caused delays. Then finally the complex situation in Gaza led to Israeli league’s opening postponement by 3 weeks, ending with the first game on Monday.